• Stainless Steel splatter windsheld surround is included. • Stainless Steel full-size Drip Pan to catch any excess drippings. • Stainless Steel Cooking & Coal Grates - no rust or porcelain to chip and lodge in food. For clean-up, just use a brass bristle. • Stainless Steel Handle for easy moving - no wood to split or discolor. • Lighting Port for easy reliable lighting. Eliminates lighter spark that only works sometimes. • 7" diameter rubber tires on heavy duty nylon hubs. • Stainless Steel Cooking Hood attaches and removes easily for cleaning, included with MG-25 Mobile model. Closed cover cooking for baking and slow cooking. Complete with left, right and center handles. 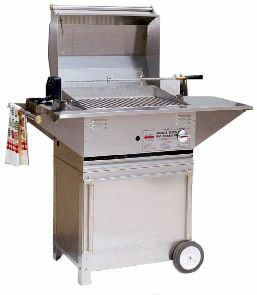 • Stainless Steel Mobile Cart to compliment the barbecue. Completely weatherproof to withstand any envornment. 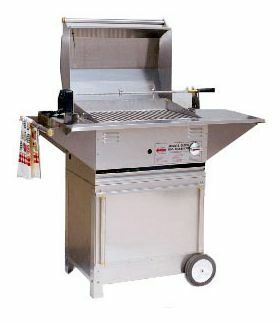 The entire barbecue is designed to be outdoors without the rusting or pitting associated with most other barbecues. • Completely assembled at factory before shipping. It's ready to go, as soon as you receive it. • Shipping weight is 135 lbs. Cooking Area:	22 3/4" x 16"
Cooking Area Sq. In. : 358 sq. in.